Whether you are the publisher of the original content, or the opinionated commenter, you most often are left with a mere sliver of a limited vantage point of the current state of discourse and its connectivity to everything and everyone else. Echo is one such Modular Innovation striving to solve this. enhancing and being enhanced by the ever growing web of relationships, connections between person and person, person and product, product and product. by the means you want. Whether you are the publisher of the original content, or the opinionated commenter, you most often are left with a mere sliver of a limited vantage point of the current state of discourse and its connectivity to everything and everyone else. Some products, some services, today, are striving to bridge these gaps, make everyone more connected, make knowledge more connected, and further empower everyone through the expanding continuum of means to generate and follow conversations and their relationships. These products are services are known as, and part of, Modular Innovation. And, Echo is one such Modular Innovation. Echo is a commenting module for websites and blogs that allows for bi-directional communication, aggregating comments from outside the web product within which it is installed and distributing those locally made comments to other web products, such as Twitter, Facebook, etc. facilitating the continuation of the reverberations created by the web product’s content through the optional distribution of new, locally made comments back to the external, social spheres, e.g. Twitter, Facebook, etc. There are definitely many challenges facing the evolution of Echo and its founder’s perception of it within the larger ecosystem of Modular Innovation. Most directly, its challenges can be seen coming from Echo’s two chief competitors: Disqus and IntenseDebate. Where Echo, best displays its strengths are in Integration and User Experience. Where an Echo conversation is seen to be ongoing within a web product, it can be seen, in motion, in real-time, fully interweaving conversations both local and remote into a single, cohesive whole. The user experience is more inline with a distributed conversation, continuous across a variety of platforms, and centralized. When content within a web product is augmented with Echo, the resulting discourse is treated as a whole, no matter its source; local comments are not separated from remote ‘reactions,’ as occurs in Disqus. Whirlpools: Turn long conversation threads and similar comments into neat clusters of activity. Split Stream: Split the Echo stream between comments and other ’social reactions’ with total control over the visual layout. 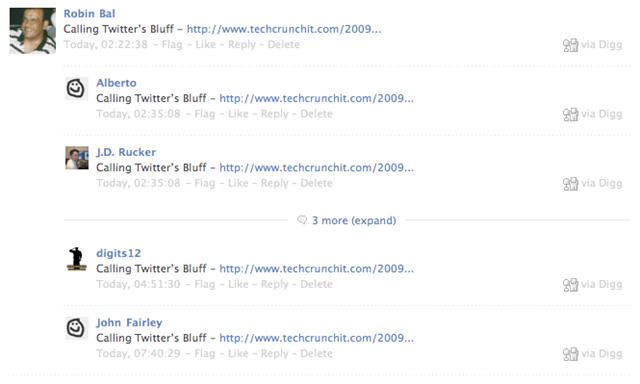 Social Likes: A lightweight way for readers to participate by endorsing each other’s comments. User faces and names are displayed for everyone to see. Pause: An intuitive and subtle feature that simply queues any new items from appearing in the real-time stream while the user is hovering over Echo. … Echo also announced the continuing mainstream adoption of the product, along with the underlying principles of Modular Innovation, through the receipt of new customers: CBS/CNET, Discovery News, Dow Jones Local Media Group, Hearst Digital News, etc. Chris Saad, VP Product Strategy & Community at Echo and co-founder of the DataPortability Project, has a perspective on Echo and the Internet, at large, strongly founded in the core principles of Modular Innovation. "Where we once built websites – destinations that attracted ‘traffic’ from which we monetized ‘eye balls’ – that had loose connections in the forms of links, we now build widgets; lightweight pieces of functionality that connect countless sites and services using rich, deep and meaningful pieces of functionality. Like individual neurons, "sites" must now maximize their connections to outside data sources and applications in response to external stimuli or risk being pruned themselves. " "More profoundly, though, the connections between those pieces will be just as important as the pieces themselves. The connections will be interoperable and create spontaneous meaningful interactions." So, with what aspects of Modular Innovation is Echo strongest? Most prominent to the successes of Echo are the characteristics: Interoperability and Sharability. … and also permitting the pushing out of users’ new comments to most of the same products. providing remote functionality in place of the local, built-in equivalent. This level of Redundancy allows for the administrators of products that make use of Echo to run old and new commenting systems in parallel, in turn, allowing for the uninterrupted continuation of the dialog should the remote system cease to exist or the primary party’s product priorities change. Also at the heart of Echo is the Sharability of most of its content (excluding user Settings). When users post new comments, they can optionally share with one or more of the supported web products (listed above). If a news article is posted to LinkedIn, with a URL matching that of Echo-enabled local content, then when comments are made on the LinkedIn article, they should be pulled in to the local, original content. When replying to a comment that originated from an external product, the reply should be posted BOTH locally and as a reply on the external product, thereby maintaining the Connectivity and flow of the conversation. Allow for the local content creator to specify hashtags, or for hashtags to be extrapolated from the comments or content, to be able to selectively broaden the expansion of a conversation — not requiring a URL to always be the unique identifier of externally occurring content. Not all of the functionality is immediately clear, especially to a new user, when faced with the email-feeling new comment form. Individuals who implement Echo would benefit from being able to configure a more flexible user experience, forcing the display of some or all of the available ‘from’ and ‘to’ options. Enabling unlimited levels of threaded conversation. Allow administrators to, per page/post, disable and/or limit commenting. For example, if a WordPress blog post or page is set to ‘disable comments’ or ‘disable new comments’ then Echo, too, should not permit comments. Echo is a very exciting product, with tough competition, whose presence is being heard loud and clear throughout the Internet, with reverberations influencing all flavors of the coming generation of web products, Modular Innovations. As more products (from Twitter and Twine to Google and Microsoft) adopt the core principles of Modular Innovation, the relationships we all have with one another and the products and services we use online will dramatically evolve and forever change. come back to share your experiences. Who do you think will win the commenting system battle? Is there room for more than one winner? What do you think should be next in commenting? in Modular Innovation? Wow thanks for taking the time to review Echo and its underlying principals so thoroughly and accurately! It’s very exciting when the work and thinking you put into something is appreciated by others. Also thank you for the constructive criticism and feedback – we are paying close attention and will continue to improve as quickly as possible. This is first and foremost an excellent template for a product review. Its accurate in its praise and constructive in its feedback and criticism. I do think Echo is ahead of the curve due to the fundamental architectural principles, that you described, that separate it from the rest.